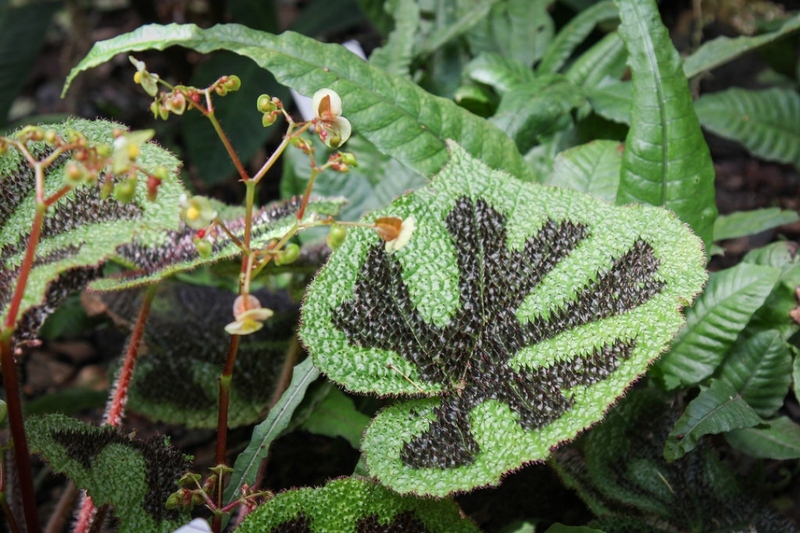 Iron cross begonia (Begonia masoniana): growing, planting, caring. A begonia for your home. Full description for the iron cross begonia not yet available. Begonia masoniana can be recognized by: Its leaves are oval, with pointed ends. They are embossed and covered with reddish hairs. Its shape is compact, and its leaves measure up to 20 cm. The flowering is in summer, with small white-green flowers in cymes. Water only by soaking, twice a week on average. This watering rate can be reduced to once a week after flowering. Soaking or drenching involves immersing only the bottom half of the pot, so that the leaves and heart of the plant are never moistened. Your begonia will be very happy outside on sunny days! Acclimate gradually in the sun, without ever exposing it to direct light.